Some children go for walks with their parents, others go shopping, and some spend time catching up over a coffee, but one mother and daughter duo have stepped up their game by spending quality time flying planes. 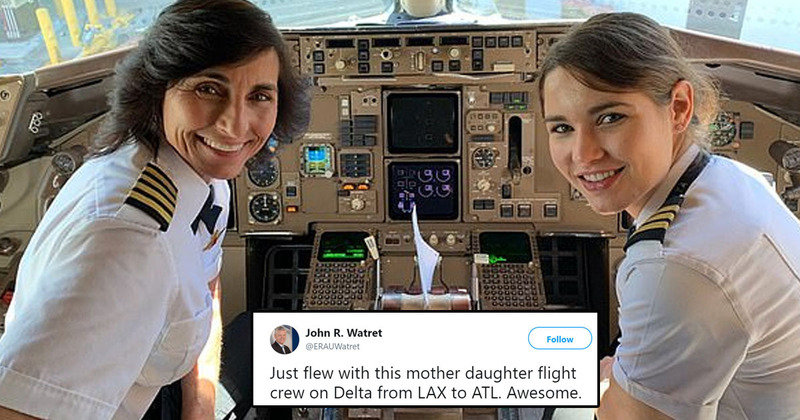 Passenger Dr John Watret was flying from Los Angeles to Atlanta earlier this month when he learned the pilots in charge of his flight weren’t just ordinary co-workers. Captain Wendy Rexon and First Officer Kelly Rexon are a mother-daughter team who work for Delta Airlines, taking charge of the plane while making sure passengers and crew arrive safely at their destinations. John, the Chancellor of the Embry-Riddle Aeronautical University’s Worldwide Campus, loved finding out about the pair’s relationship and decided to share it with the world. Just flew with this mother daughter flight crew on Delta from LAX to ATL. Awesome. He added how the duo were inspiring to young women, and the internet clearly agreed, as his photo gained over 42,000 likes and 16,000 retweets, at the time of writing. John recalled the moment he found out about the pilots to The Embry-Riddle Newsroom, explaining another passenger had asked an attendant if her two children could visit the flight deck, and when they returned, he heard them discussing the mother and daughter. I thought that was amazing. I was in awe. I asked if I could visit them, too. I don’t tweet a lot. On Sunday morning, my phone was blowing up. Embry-Riddle is committed to creating more opportunities for women in all areas of the aviation industry, so the chancellor was thrilled to help spread Wendy and Kelly’s story. There has to be more diversification in the industry. It’s crucial and one of the key factors we focus on. When there are more opportunities, everyone wins. According to Yahoo, Wendy and Kelly aren’t the only pilots in the Rexon family. Wendy’s father Bill is reportedly a retired Northwest Airlines pilot, while her husband Michael, is currently an American Airlines pilot. To top it off, the couple’s other daughter, Kate, is – drumroll please – also a pilot! It seems like the family could single-handedly take over the aviation industry.